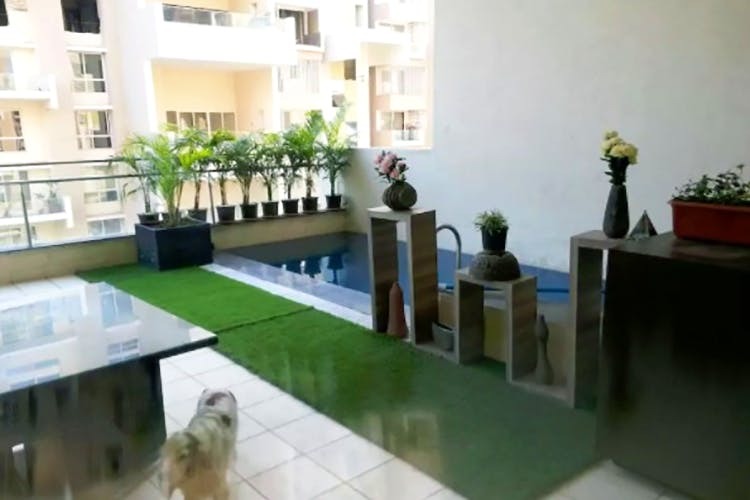 Located at the luxurious society of Marvel Bounty in Keshav Nagar, Hadapsar, we found a beautiful homestay with elegant decor and a lavishing plunge pool, that won’t cost you much. Owned by Mr. Devesh, a retired army officer, this luxury apartment of 5,000 square feet, has four massively spacious bedrooms. However, only two are available for guests. Perfect for a gang of four, the place offers all the basic amenities, from air conditioners to television and WiFi. There is a kitchen where you’re allowed to cook meals. The rooms have collapsible double beds and a massage chair at your disposable. There’s a beautiful balcony filled with flowers and potted plants. Sitting here with a cup of coffee and a book, is perhaps the best feeling ever! Last but not the least, there is a plunge pool for the guests. Carry you swimsuits and enjoy a soothing time out here. Price: INR 1,491 per night on weekdays; INR 2,000 per night for weekends. There’s a cute little doggo in the apartment you can play with. He is extremely friendly! Take a day off and stay at this luxurious apartment. The place is also quite close to Amanora Mall, Kalyani Nagar and Koregaon Park.